Be prepared to experience Kai Tak Airport like never before! 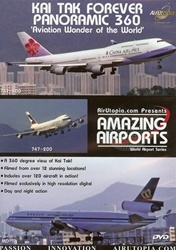 This aircraft packed DVD was filmed in new high quality digital format from over 12 locations in and around Hong Kong. You'll be able to enjoy the sights and sounds of Kai Tak from street level, mountain top, towering high rises, seaside piers and from both airside and inside! 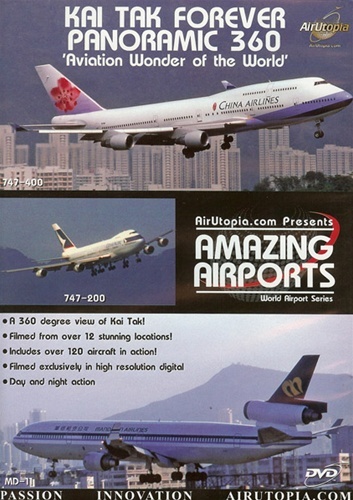 See why Kai Tak will live forever in the hearts and minds of aviation fans around the world. Welcome back to Kai Tak! A 360 degree view of Kai Tak! Over 120 aircraft in action! Run time is about 95 minutes. Format is NTSC DVD and Region-Free.